We've tried to answer some of your most frequently asked questions in the section below. Take a look, and if you haven't found the answers you're looking for then please get in touch using one of enquiry forms or email us at info@dinkydoodlers.co.uk. Do I need to sign up for the term? ​ We do ask parents to sign up to either the full term or half term so that we can guarantee your place. Payment can be made by cash, cheque or bank transfer and your tutor can let you know costs when you attend the class. At both our holiday sessions and pre-school classes we do offer a £2 discount for each participating sibling. Absolutely! We'd love to have you join us at a single payment class to see how you and your little one get on before you commit to the rest of the term. Send us an email to info@dinkydoodlers.co.uk, message us on Facebook or give us a call and if we have space we'll book you into one of our classes for a trial. Do I need to stay with my child during the class? Yes please! Throughout our classes the children remain the responsibility of their parents, and it's down to you to make sure your little ones are using the materials safely. We design every activity to be as suitable as possible for the children, but there may well be times where a willing pair of adult hands will be needed! I came along for a trial and my child seemed a bit overwhelmed - does this mean they're not interested? ​ Some children can appear to have no interest in the structured activities on their first visit - this is perfectly normal! A room full of interesting things, new children and enough space to build up a decent speed can all combine to feel a bit overwhelming. Children need time to adapt and we find that with your support very soon children who were unsure or distracted join in with one activity, then two and then before you know it your kitchen is filled with priceless artistic treasures! We think it's great to have something to aim for, but the structured art activities are merely a guide to things that can be made by little hands with big-hand helpers! 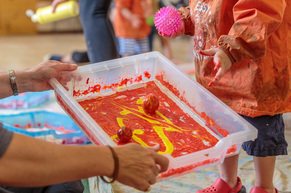 We try to use a range of engaging and exciting paint techniques (such as sponges, bubbles, string, balls and stampers) and our sessions are as much about exploring and having fun with these materials as producing the finished artwork. We know it can be hard to let your child work independently sometimes - but allowing our children to choose where they make marks, or place materials is all part of their development! We provide aprons for the children in a range of sizes, but obviously sometimes paint and other materials will end up on clothes. Try not to worry about getting clothes messy - if you both come dressed ready to make a mess then you'll be able to focus on just having fun together! My child seems worried about getting messy - is this normal? Absolutely! While some children are happy to dive straight into paint and mess others prefer to take a step back. Try to encourage your child by joining in and show them that it's ok to get messy! Be patient and don't force your little one - children will adapt in their own time and watching the fun others are having getting messy and exploring new textures will soon work it's magic!